A Bird Hunter's Thoughts: Hunting Food on the Road! When I travel, I occasionally stumble across fantastic cafes, restaurants and other eateries. One,I've mentioned before, deserves another mention, just because it never changes and it is consistently exceptional. 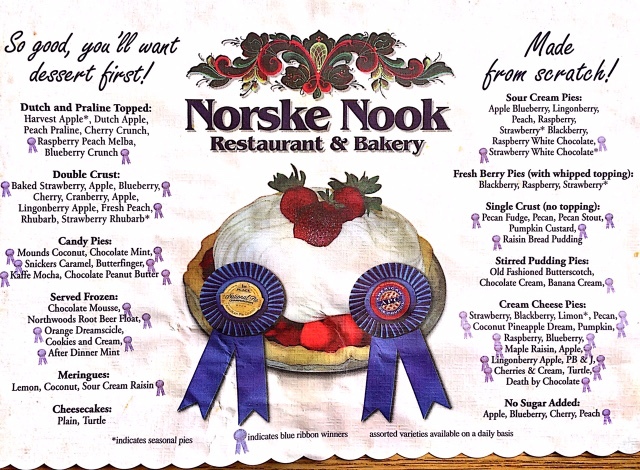 The Norske Nook in Osseo, WI (off I-94 south of Eau Claire). Homemade pies, bakery and an outstanding menu served by really nice folks make this a mandatory stop for The Beast. FYI: After an omelette, with Rye toast, orders arrived to bring home Harvest Apple, Sour Cream Raisin, and Snickers Caramel pies. Good stuff!